What specific high school classes and activities would be most helpful in preparing for being an orthodontist? Take biology, chemistry and anatomy courses in high school. Also, playing a musical instrument will help with manual dexterity. I have just removed my braces and got a set of retainers. After reaching home I realized that my retainer does not cover my back molar on the left side. Is this something to worry about??? Hi, No it’s not a problem. Hi. It is either decay, food stain or adhesive. Show it to your orthodontist the next time you see them. How long do you have to go to school to become a orthodontist compared to going to school to become a dentist? You have to become a dentist first to then become a specialist of orthodontics. Undergrad 4 years, dental school 4 years, orthodontic residency 3 to 4 years. Hi I am a 38 year old female who is undergoing orthodontic treatment for sleep apnea. According to the ortho and referring dentist I have been told that using the damon system to expand my palate will help with the volume and add room for my airway. Unfortunately I also have a long uvula that hangs in my throat and reduces my airway to only 38%. My question is about two small spaces that refuse to close between right tooth 2 and three and 3 and 4. The first year of treatment one doctor spent moving my teeth back to fix my bite and the next year another dr spent pushing every thing forward to add volume.I had no spaces before treatment. I now have large spaces in front of my second to last teeth created by activated stops and springs. The dr put on 3 power chains in 3 months and the space between 2 and 3 and 3 and 4 wont close or budge. I am so frustrated and he keeps telling me it needs time. But the 2nd right tooth is in front a little and it hasnt budged in 3 months. They are set to come off next week. It has been two years and I am done with waiting. I am spending 8000 on this treatment and I have been very patient but my goal was to try a sleep appliance because I could not tolerate cpap and they sold me on the ortho treatment. I can barely afford it. I am very frustrated. Thanks for any input. I think I deserve perfect teeth of I am paying 8000 and they cant even prove that the apnea has improved. My tmj has dissappeared though, and I can breathe through my nose a bit better. The other thing is that he had taken off the stops and made the wire bigger and the spaces closed then I had the wire off for a week for a wedding and when he put the wire back on he put the stop on too and it opened the spaces. He doesnt seem to want to listen to me. I think he needs to take the stops out and do a smaller wire. He said that the tooth that has the space is forward and could be tipped back with a retainer. Do you think it may help close the space? You may want to read this article about treatment options for obstructive sleep apnea (OSA). CLICK HERE Just moving the teeth may not help with OSA. Using a CPAP, a mandible advancement appliance or orthognathic surgery may be indicated. The black stuff is food stain. It may come off with brushing. If not, they will remove it when you have your teeth cleaned. It can be normal. If the pain doesn’t lessen, call your orthodontist. what to do if great pain occurs during the second day of braces. i’m currently on day three and I cannot chew at all, the pain is too much. I have been eating cereals and soups only so far what can I do? That sounds normal. Only time will help. It takes about 4 days for the pain to subside. All teeth become mobile when braces are applied. Also, it may be a primary tooth or trauma from occlusion. It is time I change the wire on my braces to a thicker wire for more pressure. But when I called to make an appointment, my ortho is not available until a month later. Delaying the process. I don’t see a difference in a while like I used to when I just started having braces on. So is my teeth still moving? Or will it ONLY move when I get an adjustment? Your teeth are still moving, just not moving as much. That’s good. When you have a SARP is there an immediate gap between the front teeth? if no how long will it take to appear?\Do braces need to be on prior to the SARP or can they be put on afterwards? Most of the time, an oral surgeon will expand the palate during the surgery so you will have a space. Usually braces are placed at a later date. Hi! I have a permanent retainer on my top teeth, and it fell off today. I have scheduled an appointment with an orthodontist on Tuesday. I am just a little bit worried because I had a gap in my front teeth (a pretty big one) and I don’t know how quickly teeth move, but I’m worried that my front teeth will move apart again. Do you think I’ll be fine until Tuesday and any suggestions as to keeping my teeth the way they are permanently? Thank you very much! Chances are a space will not open that fast. If it does, your orthodontist can make an active retainer to close the space. I’d have your orthodontist place the fixed retainer again. Is it safe to re-wear an Invisalign tray after not wearing any trays for awhile? I completed an invisalign express treatment (10 trays) and then had double jaw surgery. By the time I finished the 10th invisalign tray, my teeth were very straight. I wore the last tray up until the day of surgery. Immediately after surgery, my new bite and teeth looked great (as perfect as perfect could be!). However, I wasn’t allowed to wear my trays for the next 3 months following surgery so everything could heal properly. In that time, some of my teeth relapsed a bit – specifically, my mandibular incisors. I went to my orthodontist a few days ago, for the first time since surgery, and he said that he would try to order me another 10 trays, but we both agreed that another 10 sets of trays would be excessive for what I needed to fix. He recommended that I try to wear my 10th Invisalign trays again – which would obviously be the cheaper, faster, and potentially more efficient solution. I’ve been wearing them for almost 24 hours now and they hurt a lot, more so than I’m used to. I was able to get them on, but they’re not pushing into the Invisalign tray 100%. After all I’ve been through, the pain is a non-factor. However, I’m concerned that I might be causing damage. I see no problems in you wearing the 10th tray. It may move your teeth back and you will do no harm to your teeth. Give it a month and if your teeth are in good positions, see your orthodontist for a new retainer. Call and tell the office manager that the bracket is off. They will probably fix it Wednesday. Most offices replace brackets without an additional fee, but every office has their own policies. I had a mouth palate on the roof of my mouth for a year and when it was taken out, the roof of my mouth was all bumpy and inflamed and hasn’t healed yet. I got it removed on October 12. Is this normal because I can’t find any other advice on this topic. No. If your gums are inflamed, puffy and bleeds easily then see your family dentist. You may have gum disease that needs to be treated. Hello. I am an adult from Mumbai, India and I have decided to wear braces to correct my bite. After consulting couple of orthodontists, I have decided to go for ceramic/clear self-ligating braces since I believe they are the least visible ones (I am not a suitable candidate for lingual & aligners). However, I am confused between which brand of clear/ceramic braces to go for. From whatever I know, there are different options like Damon Clear, 3M Clarity, Inspire ICE, In-ovation etc. I believe some are tooth coloured and some are translucent. The most important thing for me is that it should be as less visible as possible,hence no metal parts in the brackets. Kindly help me choose the best option provided the pros and cons of all options are more or less the same. Hi, Most orthodontists will carry only one type of ceeramic bracket, not multiple, so you may want to ask the orthodontist which one they use. I like 3M Clarity because they are made to be easily removed when treatment is completed. Most self ligating clear brackets have some metal clip to hold the wire into the bracket slot. I like tooth colored ceramic brackets over the clear/translucent ones because I believe they are stronger and hold up better. At a distance, all of the ceramic braces are less noticeable than metal braces. Hello. Sam here again. Apart from the type of braces part, I am also confused about which orthodontist to choose? I have a deep bite which needs to be corrected. Along with it I also have a slight TMJ issue (clicking and deviation of jaw while opening my mouth. However, there is no pain). 15 years back I had started my ortho treatment and during that time 2 of my premolars were removed to create space. I left the treatment midway and because of that the gap remains. Now, I have shortlisted 2 orthodontists from the 9 i consulted. Both are reputed orthodontists. Both have said that at the end of the treatment I will be needing implants to be put in the gap in my upper teeth. Both are similarly priced. How do i choose between them? Experience or better doctor-patient interaction? Hi. Since you are going to be in treatment for several years, I’d choose the orthodontist you are most comfortable with and you can talk to easily. You want to be able to feel very comfortable in asking your orthodontist questions you will have during treatment. This will make your treatment more pleasant and put your mind at ease. Hi, I got braces about 2 months ago and got a herbs appliance also, right now the back of my mouth on the right side I have a huge lump on my inner gum next to my last molar. It’s seems to be swollen . Should I schedule an appointment? This has happened before and it went away. Do you know what it is? Or why it’s happening? Hello, It sounds like pericoronitis, inflammation around the crown of the tooth. When the most distal molar is partly covered with gum tissue, bacteria or food can become impacted into the periodontal pocket and can cause inflammation of the gum tissue. You need to clean the area real well by flossing and brushing. You can use a water pick or syringe on the distal portion of the crown to get any debris out of the periodontal pocket. Also use a mouthwash like Crest Pro-Health. If it doesn’t go away, see your family dentist. Hi. Hate to hear you are having problems. You will need to see your orthodontist for a repair. The edge of the metal band needs to be smoothed off. It will not get any better with time. I am planning to get a braces done but I’m worried that I can’t because of my missing teeth. On my left side, I lost 2 molars teeth and 1 wisdom tooth (all 3 back teeth were gone). However, my teeth are still in their respective positions because I haven’t go to the dentist to remove the roots yet. If I get a braces, wouldn’t the gap be really empty ? I would like to get tooth implant but it is far too expensive for me. The cost for 4 implants are way beyond my budget. I also have a missing premolar tooth on my upper right side. I haven’t take out the root yet. So if I remove it and inserts a braces there, will both of my molar teeth move forward ? If yes, is it hard for me to chew based on what I have discussed above ? I noticed that both of my upper front teeth are starting to look translucent. What I mean is that, I could see white thing inside the yellow teeth of mine. Does that mean my front teeth are dimineralised ? I could send you a picture if you need one before making a conclusion. Sorry for this lengthy question and I appreciate so much for your help ! Hello. Based on your description, your case is a little complicated to treatment plan over the internet. You need to get your mouth in a good state of oral health before consulting with an orthodontist. All root tips, since they can be a source of infection, need to be removed. Once your family dentist says you have no contraindications for orthodontic treatment, consult an orthodontist. Hello. I am getting my braces off soon, and I cannot wait. For some reason though, my orthodontist is taking my impressions for retainers before removing my braces. Aren’t the impressions taken after I get my braces off? Thanks. Hi. It depends on what retainer is going to be used. At my office, I take impressions with the braces in place if we are going to use a hawley retainer for retention. If I am going to use an essix (clear) retainer, I will take an impression for the retainer after braces are removed. I would like to know what’s the difference between deep bite and severe overbite. I tried to look up on them but the images of deep bite and severe overbite look similar. I’m confused. Hi, a deep bite and a severe overbite are the same thing. The more proper term to use is an overbite. It’s determined by the vertical overlap of the anterior teeth. We would like to see about a 20% overbite at the end of treatment. Our orthodontists would like to remove one of my son’s an adult teeth. The tooth has not yet come in and due to movement of another tooth , there is no room for this adult tooth. In the ortho’s opinion moving the tooth that had moved will be a big deal with no guarantee that it will open the space for the tooth he wants to have removed. This seems reasonable to me, but our dentist suggested there could be issues (TMJ (?) ) later in life due to the asymmetry . Should we be concerned? No, you should not be concerned about the extraction. There is no basis in our literature for TMJ dysfunction to occur due to an asymmetrical extraction followed by orthodontic treatment. TMJD occurs mainly from clenching or bruxism caused from being stressed. New orthodontist took over former orthodontist’s practice. I came back for a retainer check; had many checks after having braces off a year and a half by former orthodontist, whom I appreciated and like his work. I asked new orthodontist about a very small space between teeth. Orthodontist shaved back of 4 teeth. Now surface is very abraded,and no longer smooth, and curve of eye teeth, (back) is missing. He told me this may or may not close the teeth space, (very small space). Is there damage to the back of my 4 teeth now? These are two incisors, and 2 canine teeth. Orthodontists will, as needed, perform occlusal equilibration to adjust the occlusion. It is normal to do so and may help allow your space to close. There is a lot of enamel in certain areas of the crown that can be removed without causing problems with the tooth. If the roughness bothers you, you could ask at your next appointment to have it smoothed. Hi my 16 year old daughter has had braces on her top and bottom teeth for about 18 months. Initially we were told she would have them for about a year. Now being told maybe next time every appointment as to when they will be removed. Have just noticed her bottom front teeth are getting gaps that were never there before. Can you tell me why this is happening. These spaces, that are opening up, could be from a variety of reasons from elastics being worn or biomechanics that is paralleling the roots. Using an elastomeric power chain will help close the spaces. Sometimes spaces can be hard to close and that may be why your orthodontist is going longer than the estimated treatment time. I’ve just had a quad helix in for 7 months to treat a crossbite, but after my ortho removed it a few days ago despite my thoughts that it wasn’t done at the back, I’ve taken pictures and realised I still have a crossbite at the back. Can this be treated with RPE? Should I be thinking of getting a different ortho and different treatment? Thank you so much for offering this help, I wasn’t sure where to go! It looks like there is a slight posterior crossbite with teeth #2 and #31. I’d go back to your orthodontist and see what treatment they suggest. They may suggest buttons with crossbite elastics or Invisalign Express 10. I don’t think an RPE is needed. I have a permanent retainer on both my upper and lower teeth. My upper permanent retainer fell out today, but I still have removable retainers I wear at night for both upper and lower teeth. I was wondering, can I just wear the upper removable retainer and not have to get it fixed? Will my teeth move in the removable retainer if there is a space in the back where the permanent retainer used to be? Thanks! You can try only your removable retainer and see if a space opens. If it does, see your orthodontist. I’d suggest you call your orthodontist to see if you need the fixed retainer repaired. In some cases, extra retention is needed by using both. After having Invisalign I now wear Essex retainers on both top and bottom teeth every night. In the morning after wearing them I’m able to push my jaw forward and nibble the tips of my front top and bottom teeth together (like if I were to try and rip a piece of lettuce between them). But as the day goes on I’m later unable to get the front top and bottom to hit against each other, it’s very close but my back teeth make slight contact before this can happen. My teeth obviously do not move in those few hours, but it seems the way I’m able to move my jaw does change. My teeth and bite are the same since getting my Invisalign off, and it’s not an issue. I’m just curious as to how wearing the Essex retainers at night makes my jaw able to touch the tips of my front teeth together in the morning. IMHO, I’d say that the essix retainers slightly intrude your posterior teeth ever so slightly to get rid of the posterior premature contact. It’s no big deal. As your essix retainer wears, it will have less effect on posterior movement. I will have an intervention that consists of 2 implants in the upper part. I’m trying to decide which option to go: zirconium or titanium. I found reviews pros and cons on both sides. I read about zirconium that adapts better to the body. Titanium may present allergies in some cases. Zirconium did not passed the test of time yet, though I found information that it dates from 1987, so almost 30 years. Can you please help in order to decide? You need to ask your general dentist and your oral surgeon this question. I’d suggest you go with titanium implants due to long term data showing long term success rates. This is a good article about zirconium vs titanium implants. My Daughter had a chain attached to her right front tooth which is impacted. She will be having braces fitted at the end of January. It has been 2 and a half weeks since her impacted tooth oral surgery and the chain has detached and is hanging down. Why has this happened and what must I do? It is normal for the suture to disolve and the chain become loose. Nothing needs to be done unless the chain is real long. It can just dangle. Call the orthodontist and see if they want to attach the chain to an adjacent tooth. I have a slight overbite and weak profile. My lower jaw used to be very weak, and it made my profile look bad (weak chin, big nose). After 3 years of wearing braces it got better, the jaw is not as weak as it used to be, but I’m still not satisfied with it. I still feel like I have a slightly withdrawn lower jaw and weak profile. Since it’s not a huge problem, I don’t think surgery would be a good idea. Is there any way to correct this? Braces again? I don’t mind the overbite, I actually like it. I just want a stronger lower jaw. Orthognathic surgery is probably the best option for you. 2nd option would be a genioplasty. See if your family dentist will refer you to an oral surgeon for an evaluation. Hey I just got powerchains a few days ago & hours after getting them I started getting bubbles on the roof of my mouth they would move around throughout the day & flatten but now I have Raw red spots that burn what could this be? & should I be worried? If the spots stay more than a week, see your family dentist. I don’t think it is related to the powerchains. I am currently a senior in high school and about to graduate and go to college. I visited an orthodontist and he recommended that I get braces, which will last for about 3 years. For this, it will require the removal of all 4 of my 1st Bicuspid and 3 of my wisdom teeth. I was wondering how long it will take for the gap for these removed teeth to close. Also since I am heading to college next year and most likely not going to be near home, how can I ensure that I can transfer my orthodontic treatment efficiently and cost effectively, before I start my treatment plan. I know the best option is to wait, however, I would like to start immediately on this treatment. If you have a lot of crowding, the premolar extraction sites will close quickly. I’d say less than a year. As far as transferring back and forth from two orthodontists, you have to work this out among the two orthodontists. Ask them if they can work out an arrangement. However, it would be better to stick to one orthodontist for treatment and continuity of care. It would be a lower cost for you if you can travel back home for treatment. Im 15 with an overbite, i have been pushing my jaw forward for around a year or so and I have had braces for around 5 or 6 months. When I get my elastics, can I still hold my jaw forward to hide my overbite, im scared of going back to my “regular” bite because people see me as the version with the jaw pushed forward.If i cant, do you know of any treatment where I can hold my jaw while getting the bite fixed, thanks. You can hold your jaw in a forward position as you wear elastics. That will help get rid of your overjet. Hello. We’ve been told that our 14 year old son needs braces, an expander and a appliance such as the herbst or forsus. One of the orthodontist that we’ve seen for a consultation would like to use the herbst and the other would like to use the forsus on him. I’d like to know if there is a benefit to using one over the other as far as getting the maximum desired effect. My son thinks that the forsus looks a bit less invasive to have in his mouth and seems to prefer it but as parents we just want to use whatever method will work best for him. Thanks so much. I think Forsus is the better of the two. Forsus are not as bulky as a Herbst appliance and you get good results. It is spring loaded and a little more comfortable. Hello again Dr Thompson. You had replied to my question a few up about my 14 year old son and the herbst and forsus appliance. Thanks so much for your answer, I know my son will be happy to hear that the forsus will work. I do have an addition question for you as we had one more consultation since my initial question to you which confused me even more. This 3rd orthodontist recommended that we pretty much just do braces and rubber bands with the option for pulling a couple teeth (I prefer not to) or if necessary down the road the forsus or herbst (although he prefers not to). I’m not so sure that my son will get the desired results for his facial profile with just the bands and braces though. We’ve been told that he has class 2 malocclusion with a closed deep bite and narrow palate if that helps. Which treatment method of the 2 would you recommend forsus & expander or just the bands and braces and possible extraction of teeth? This is a huge expense for our family so I just want to be sure I’m dotting my i’s and crossing my t’s so to speak beforehand. Thank you again. I like the results from moving the mandible forward with Forsus and expander. Usually the problem is a deficient growth of the mandible which upper extractions will not address, IMHO. This is an opinion without an examination or records of your son and for a general discussion. Your daughter should be fine. Your orthodontist needs just a couple of links to activate the chain. A very flexible wire will be bent up to the chain to put pressure on it. If the chain is too short, it can be extended with a wire tie. You will need to see your orthodontist for new retainers. Your old retainers cannot be fixed. Never use boiling water with retainers. It will always distort them. To clean retainers, use an ultra sonic cleaner and retainer brite cleaning tablet that can be purchased from our shop. I am on Tray 4 of my invisalign treatment. I have a deep bite so I have the bite ramps on the top four teeth. However, I’m worried because I (unconsciously) shift my jaw back so my back teeth are behind the bite guard so my back molars can touch. I don’t do this on purpose, and when I notice I’m doing it I stop, but I am worried it’s going to mess up my treatment. I’ve brought up this concern with my orthodontist and he said,”yeah you shouldn’t do that.” But that doesn’t really help me because I am not trying to do it, my jaws just want to touch. Do you have any advice on how I can stop this or if something about my treatment should be changed? I’d say you will be fine in the long term. The bite ramps should work. If not, your orthodontist can rescan your occlusion at the end of treatment or during and order new aligners. My daughter had her braces removed but not the gold chain (it did not pull the tooth down), her orthodontist said that the gold chain does not need to be removed, is that true? Will it cause damage/health issues in the future? I’d say a chain left in the alveolar bone should be removed. The body will react to it as a foreign object and a tract for bacteria. I’d consult with an oral surgeon to have it removed. The orthodontist put a white rubber tube over one of my front tooth. I’m not sure why there isn’t a bracket but i think it is something to do when I knocked half of my tooth out. The rubber tube is turning a yellowish/greenish colour. Why is this? Have I done something wrong? The food you are eating and the bacteria is staining the white rubber tube. It’s ok if it changes color. Just ask your orthodontist to change it if it looks bad. Hi I got my braces off about a month ago and am using removable retainers. On the bottom retainer the very corner of it has broke off is this bad? It’s ok. Continue to wear the retainer. Show the broken piece to your orthodontist at your next visit. This is a very complex issue and there are a variety of factors to consider how the upper lip interacts with the upper incisors. Some generalities: In a young person, the upper incisors show as they speak. As a person gets older, only their lower incisors show as they speak. Gravity takes it’s toll and causes the soft tissues to droop. Showing 2mm of incisal edge, at rest is normal. Some patients have a long lip, and a lip shortening procedure is indicated by a plastic surgeon. In some cases, the maxilla is deficient in it’s vertical height and orthognathic surgery is indicated by an oral surgeon. Some cases, the incisors are intruded and need orthodontic treatment to flatten the occlusal plane. People who show a lot of gum tissue when they smile either have a hyper active facial muscles that pull the lip up, a short lip, vertical maxillary excess or bimaxillary incisor protusion. Your best option is to continue your consultations. I’d suggest consulting with a plastic surgeon. Write all the opinions down. Make an informed decision and proceed. I would guess that reverse orthodontics is opening up spaces where extractions had been performed and space closed by previous orthodontic treatment. I would really appreciate your honest opinion on the following matter as my orthodontist seems reluctant to provide me the answers. I had a double jaw surgery to correct my anterior open bite with overjet. Now, after the surgery, I have a posterior open bite and because of this I have been using elastics. Due to the previous anterior open bite, my second molars are worn out/intruded and should be extruded more than first molars to correct the open bite. I have braces and brackets everywhere else except bands on each first molar and nothing on either second molar. I have no wisdom teeth. My orthodontist’s idea is to put plain buttons (looks like a round lingual button) on the cheek side of each of the second molar and first extrude the lower second molars with triangle shaped configurations of elastics on both sides. These triangles would go through lower first and second molars to upper first molar. Since the second molars would be on their own without any connection to first molars, wouldn’t there be a risk of movement/rotation to undesired direction(s) due to the force exerted by the elastics? There is no reason to move the teeth other than vertically. I would feel a lot better if the first and second molars were somehow connected with a tube and wire or something for protection. Would there be a better way to extrude the second molars? Upper and lower first molars are not in contact either, but the gaps between upper and lower second molars are much bigger. I’d say your orthodontist probably wants to rotate your 2nd molars. Either way, with or without the bracket and wire, the 2nd molars will rotate. Your orthodontist will probably place a bracket and wire on the 2nd molar at a later date. An other reason your orthodontist may want to pursue the 2nd molars this way is because she/he doesn’t want to change your heavy wire at this time. Stability is lost when we go to a thin wire right after surgery. Also finally, a bracket and wire may limit the amount of extrusion that could occur. Interarch elastics is a good way to extrude teeth. I’d say you are in good hands. I hope I was helpful. I recently had my braces removed, but I am having a really difficult wearing my retainer, due to a really horrible gag reflex. Is there any reason you would not choose a permanent retainer for the top teeth? I have a crown on one of my front teeth…does that have anything to do with not having a permanent retainer for the top? Hi, Upper fixed lingual retainers do not stay on very well because the lower incisors will knock it off. Also, the adhesive that is used to bond the wire to the back side of the tooth will not adhere to a crown. It’s best you use a horse shoe shaped hawley retainer or an essix retainer. They tend to work better with patients who have a hyper gag reflex. I am a 17 year old female. I recently turned 17 in November, and only recently have I become concerned about my bite. I currently live in Mexico, so unfortunately my family cannot visit an orthodontist until we move back to the US sometime later in the Spring (there is a difficult language barrier, and our insurance is not covered in Mexico). I would say that last time I’ve visited an orthodontist was when I would receive free check-ups at school in 2015. I don’t remember anything concerning my bite, but I have been offered braces a few times in my life. There weren’t many dental issues when I was a child until my two front adult teeth grew in around the age of 11. My mouth is small, and my top and bottom canine teeth grew in with little to no room. Most of my life I thought I had an overbite simply because my two front teeth overlap my bottom teeth, but my bottom canine teeth overlap my top (however the roots of my teeth are straight if that makes sense). Is that considered an underbite or is my lower jaw more protrusive than my upper jaw? I can close my mouth easily, eat easily, and speak perfectly, so it isn’t severe. Could braces fix this? Is it too late in my life to straighten out my teeth and profile, since my face is grown into? I also heard I would need to wear an expander first. I apologize if this is confusing, if you would like I will go further into detail. Really all I want is to know options/solutions on how to get a more balanced profile, space out my teeth, and tips on how to stop grinding my teeth while sleeping (I don’t have a mouth guard). Thank you. Your treatment plan will be worked up after records. You probably have an anterior crossbite and a Class III malocclusion. It can be fixed with orthodontic treatment like an RPE, braces and elastic wear. Thank you for your reply! It was very helpful as it gave me a place to start. I feel like wearing an RPE will help with creating more space for my teeth in order to straighten them. I just wanted to know what I should do if my class 3 malocclusion is skeletal? I’m not sure if my jaws are of equal proportion and my maxillary jaw is just set back, or if I have disproportionate jaws. I won’t know for sure until I take an x-ray. Even so, I’m worried that I won’t achieve facial balance without surgery if my malocclusion is skeletal. Like I said, I’m 17 so I’m sure it’s much too late for nonsurgical treatment. I really don’t want surgery for multiple reasons. How do I come up front about this with my dentist or orthodontist? Will they try to help me regardless of financial status? Please don’t feel obligated to answer this if you don;t want to! Again, thank you!! At your consultation, the orthodontist will be able to tell you if you have a skeletal Class III relationship that requires surgery. Most orthodontists offer payment plans that spreads the cost of treatment over many months which makes it possible to go through treatment. So when I got my braces I was given a 2 year period but I only had them for 1year & 2months. My teeth were not that bad in my opinion at least I don’t think so it was just one of my front teeth was pushed forward & a little overbite. When I got my braces off I noticed still a little gap between my 2 front teeth which I never had a gap at all before I got my braces. They told me retainers were supossed to fix that. They took my impressions for a retainer & said they were gonna call me when they were ready. It had been 3-4 days & they hadn’t called me so I called bc my gap kept getting bigger & they told me to go in. They said retainers were gonna fix it I got the plastic ones at first & she told me to wear them all the time for a month so I did but the gap was still there so they gave me a metal retainer it helped better than the other ones but when I take it off in the morning by the time I put on at night there’s a gap again. I got my braces off in march of 2016. Hi, This gap between the upper central incisors is a common problem. First, the gap needs to be closed with Invisalign aligners, active essix retainers or a hawley retainer with fingersprings. Once the gap is closed, a small fixed bonded wire should be placed on the back side (lingual) of the central incisors. This keeps the space closed. finally, another essix retainer can be made to fit overtop of the fixed wire to hold the other upper teeth. Hi, I am nearly 17 years old and my teeth developed quite late (I still have one or two baby teeth to lose). As a result, my dentist held off on braces because it was not suitable for me to have braces on my baby teeth. My top left canine tooth had been sitting in my gums for a while and I could feel it as a large bump on the surface of my gum. It has since come through and after waiting 6 months it has not moved into place (it is still sitting in my gum), and it has turned on a slightly diagonal angle. My dentist recommends braces but I really don’t want them because I feel like I’m too old and they wouldn’t suit me. I was wondering if there would be anyway for me to get this tooth into place without having to get braces? The rest of my teeth are pretty much completely straight but my dentist reccomended also getting braces on th rest of my teeth (including the bottom row) to prevent them from moving as my canine comes into place. I just really don’t want braces but I need my canine to come down! You should contact an orthodontic specialist that provides Invisalign as a choice for treatment. Invisalign may be able to get your cuspid into position and you won’t have to use braces. Usually upper and lower treatment is indicated. I wonder if you could answer me this…my son had metal bands fitted today with hooks and was supposed to have his braces fitted too but his original orthodontist was not in and the trainee fitting the bands did not have time to fit the braces….the next available appointment is not until 25th April. Is this a normal waiting time or should I contact his consultant? It just seems a bit weird that he has the bands unnecessarily for the next 3 months!! Not much will happen in that three month period since you only have bands on the molars and the rest of the brackets have not been placed, IMHO. You may want to ask for an earlier appointment for the rest of the braces to be placed. Hi, That’s odd that it is locked. You’ll have to see your orthodontist for evaluation and repair. I got a permenent retainer on the top. Only when I eat my bottom teeth occasionally hits the retainer. Hi, The adhesive will wear down. If it is too heavy of a contact you may want it adjusted because your lower teeth could knock the fixed retainer loose. Hi, so yesterday my orthodontist put two buttons on the back of my teeth and put a band around them. She told me I need to start Turning my palate expander again and she didn’t put a wire back on my top braces. Will this affect my teeth? Will they go out of place and start backtracking? Hello, I doubt your teeth will move back that much. If they do, your orthodontist will be able to place them back with the new wires. Hi, I don’t think a mild flattening of the condyles would cause an open bite. You would have to have a substantial amount of condylar bone loss to cause an anterior open bite. I’d suggest you have a consultation with an oral surgeon to evaluate your condyles. Yes, they can tell if the there has been changes to the condyles. My son is 8 and has perfectly straight teeth but he has a slight underbite. Our Orthodontist said he needs an expander for 1 year in conjunction with head gear at night. At the end of the year, he’s to wear a retainer top and bottom until he’s 13 and ready for braces (so 4 years with the nightime retainer). I’m finding it hard to understand why there’s a need for braces? Will the expander and the head gear cause my son’s currently straight teeth to shift and be out of alignment thus explaining the need for braces? I understand treating a jaw at a young age is best but…. how long can we put this off before the jaw is set? Our Orthodontist said to do it before he’s 9. Hi, I would suggest starting treatment now. A Class III malocclusion should always be treated as soon as they are diagnosed. They are the hardest malocclusion to correct. The older your son becomes, the harder it is to correct and the more likely he will need orthognathic surgery. I am having trouble cleaning stubborn white marks off of my essix (clear) retainers. What would you recommend that I can do at home? Hi, You should use toothbrush and toothpaste or retainer cleaner like Retainer Brite Cleaning tablets. Denture cleaner works good too. Can a 13 year old use Invisalign braces instead of regular braces? My daughter is 10 years old and had an expander at 9 (for underbite) and has been wearing a retainer for a year. She’s due for braces in a few years and I’ve been reading up on this Invisalign product and think it’s so much nicer for a teenager. Hi, Yes Invisalign can be used with a teen. Good results can be achieved if the teen is compliant. okay so I had braces for like a year and a half just to mainly pull my teeth together in the front to close a gap in my front teeth. i lost my top retainers about a year ago and my gap is coming back a lot. so can my orthodontist just make a new retainer from my old impressions to fix it? Hi, Your orthodontist can make a retainer to close the gap but they’ll need a new model. Hi, I had braces removed August 2016, my fixed retainer has come unstuck for the 5th time. I’m quite frustrated as was told I had to have a fixed retainer for life as well as wearing a removable retainer at night forever. After the first incident my dentist cut off the part of the chain that had come unstuck at one end and said it would be ok but I have noticed some movement in that tooth. After 5 failures I’m now really loosing faith in him. I’m worried my teeth are going to drift back and that I have wasted my time and money. Hi, I’d suggest getting a second opinion. Hi, if you are breaking your braces in the same place, your orthodontist could place bands, that go around your tooth. They are more durable and less likely to come loose. I have an open coil spring going from my upper left central to my upper left cuspid to make room for my left lateral tooth that was originally completely blocked off. I had been making slow progross with space being made till I went for my visit 2 weeks ago and got a longer spring put in. Now, it looks to me like there is plenty room to go ahead and put the bracket on the lateral tooth. However, it looks as though my left central tooth is starting to turn inward and I am thinking it is from the spring. My ortho is closed today, but open tomorrow. However, my specific doctor does not come in till Monday coming up. My next appt is in 3 weeks. Should I call my ortho to see if I can come in for him to take a look or just wait for my next appt.? Also, I don’t know if this makes a difference but I have damon brackets instead of the traditional ones. Hi, I’d wait until your regular appointment. I just got a new retainer(a hawley one) today and I want to know if it fits right. It doesn’t touch the roof of my mouth and it is hard to night down on one side. It this normal of should I call my orthodontist? Hi. It is normal for the plastic in the palate region to be away from your palate, especially if you have a high vault. Dr.Thompson why is it that when you get your braces tighten it hurts and kinda itches after the next few days? Hi, When your braces are adjusted either a bend is placed in the wire or the wire is changed. The pressure causes your teeth to be sore and they hurt. That’s normal. I am on the finishing stages of my braces apparently, but my dentist told me that I have to wear band so my teeth would be aligned vertically. I noticed that I am getting a gap between my teeth on my left side, I assume it is because of the rubber bands that may be pulling the tooth to the side. I don’t think this should be happening.. Is this supposed to happen? Hi, A space can open by wearing elastics. Since you are in the final stages of treatment, you may want to be seen to have the space closed with a power chain. Had top braces for 25 months, with teeth now pretty much straight. After being told two years worst case, my orthodontist is suddenly suggesting an additional two years treatment to remove a lower tooth on the right and apply bottom braces to fix my bite, even though my midline is already off to the right by 2mm. Would this not make the midline worse? My teeth don’t touch on this side either, with quite a large gap in fact. Would the extra treatment definitely fix this also? Hi, It sounds like you need further clarification from your orthodontist about future treatment results if you proceed. Sometimes, due to adverse growth of the mandible a unilateral extraction needs to be done to result in a good occlusion. Your lower midline may go to the right more, but this may be a compromise to close a posterior open bite which I think you indicated. If you are not satisfied with your orthodontist’s explanation, you can always get a second opinion. Hi! I had my braces put on about 2 weeks ago. However, a few of my brackets have become loose already. I know those teeth won’t move, but will the other teeth around it still continue to move as expected? Yes, the other teeth attached to the wire will continue to move. Hi Dr Joseph! I have an overjet and I just got my bottom braces fitted today in breech of fixing that. However, my orthodontist never applied any brackets with hooks onto my lowers and only applied one bracket with a hook on my tops. Just wondering if she’s going to change that in the future or if there’s another way she is going to fix my over jet. Thank you! It sounds like you have an underbite. Hooks can be soldiered on the wire or placed with kobayashi ties. So, a hook doesn’t need to be apart of the bracket and can be placed later. I am a 20yr old male who recently had an orthopedic braces consultation. I have high canine teeth that have basically grown in front of the rest of my “tooth arch.” The orthodontist said my teeth were crowded which prevented the canines from coming down properly. However, she said the best way to fix this would be to remove all 4 of my first premolars and then put on braces to fill in the gaps. She also said this process would take from 2-3 years. As someone who will soon be graduating college and entering the workforce, I really do not want months of unsightly gaps in my teeth and then 2-3 of braces. I am wondering if there is any way that I could bring the teeth down without the premolar extractions (the crowding does not seem to be that bad; I cannot estimate the millimeters but it looks like the teeth can almost fit, just not quite). Also, if not, then will this process really take 2-3 years? Thank you for your time. When an orthodontist does an initial examination of the mouth, they try to determine if extractions are necessary to obtain a proper occlusion. This orthodontist thought so and recommended extractions. You can now get a second opinion from another orthodontist and ask if it could be done non-extraction. There are many factors involved in determining which treatment plan to pursue which is beyond this Q & A section. Hi I’m 14 and have been going to the orthodontist for about 3-4 years now only recently did my treatment start I had two baby teeth removed (1st and 2nd molars in the top section of my mouth) I was given a plate to hold the gap while the teeth above came down. Both the new teeth are visible now but will probably take another few months to fully come down. The problem is that I now have a few small gaps around my canines in the bottom and a bit too much space in the top, I can’t stand having gaps around my teeth not only does it look bad to me but I always get food stuck in the gaps. Do you think I need braces or that braces could be a good idea for me to consider? Hi, Gaps are not good because the contact made with the teeth protects the gum tissue and bone from food impaction. So, gaps in the posterior region of the mouth needs to be closed. See an orthodontist for an evaluation. Tell me about a typical day? Hi, a typical day for an orthodontist is wearing many “hats”. Orthodontists are usually a small business owners. We are the boss/employer, the repair man, the bill payer, the office coordinator, and finally the orthodontist. We see around 70 patients a day in an 8 hour day. Most orthodontists work about 4 days a week. If something needs done, we are the ones that either does it or hires someone to do it. All responsibilities fall on the business owner. I must say it is a lot of fun and I enjoy my work. I am a 19 year old female and my orthodontist has recommended that I use an expander for my upper jaw. Will this cause my teeth to form large gaps in between them? Is it even safe to use an expander at my age? Hi, That brown stain is food stain and is not a problem. Have your hygienist remove it at your next cleaning. what is the best treatment of choice for congenitally missing lateral incisors? My 10 year old has this problem and the Dr. recommended not to do implants, but to just push all the teeth on the sides toward the front incisors. But would that not look weird? I am so confused. Please suggest the best way to go. Hello, I believe the best option is to place the cuspids in their proper space and create space for the missing lateral incisors. It creates a broader smile and it is difficult to reshape the cuspids into the shape of a lateral incisor. I am interest in becoming an orthodontist as well, I am about to graduate High School & I have a few questions. I was wondering what did you major in ? for example, biology or chemistry. Did you minor in anything? Also, how long did it take you? And lastly, do you have any advice for starters who are interested in becoming an orthodontist ? Hi, My major was chemistry. I had no minor. I went to dental school after three years of college. Total number of years after high school to become an orthodontist is 9 to 12 years. Hi, I recently had herps and I play clarinet. Playing it was very hard for me and my cheeks constantly were torn apart and bleeding and they hurt a lot. I just got them off thank goodness. I thought that some of the pain would go and it’s been two months and it’s still the pain. I try to use wax but typically it just bother’s me a lot. What can I do to make them stop hurting because I am starting to want to quit band because I have a whole 2 more years of braces left, if this is what I have to deal with I don’t want to do it anymore. Hi. You need to talk to your orthodontist and tell them that your teeth never stop hurting. They hurt all the time. Your teeth should only hurt for 4 to 7 days after an adjustment. There may be something that could be done to lessen the pain. Hi, my 8 year old daughter’s teeth are coming in quite crooked. She had adult teeth behind baby teeth on both top and bottom and didn’t begin losing teeth till she was around 7. Her lateral incisors (I think?- the ones that are next to the top two teeth are hooked on her adult front incisors). She has a gap where she lost her baby lateral incisors. I asked the dentist about it and he said he was not sure what will happen and that an appointment with an orthodontist will be in the future. I can not find much on this online and am curious. Thanks for the help! Hello, Sometimes a patient does not have a lot of room for the lateral incisors to come in. Plus the lateral incisors can be very wide causing more crowding. The main thing we want is the lateral incisors to erupt and not be in a crossbite. Your daughter can see an orthodontist now for a consult. They can tell you if there is a problem with the eruption of the lateral incisors at this time. I just got hooks today on my top teeth when will the pain go away? And when will I be able to talk normal again? Hi, Hooks placed on the wire shouldn’t cause a lot of speech problems. Most speech problems go away in a few days. Hi, It is possible it could delay treatment. Call the office and ask them if you need to be seen. To correct a mild posterior crossbite, my orthodontist placed “buttons” on the lingual side of the last two upper molars both on the left and right side of the mouth. I’ve been wearing these elastics now for 2 months. The elastics go from the two upper molars inside to the two lower molars outside to correct the problem. I just recently noticed that on the left side only, the two upper molars on which the buttons are affixed have “rotated” outwards towards my cheek, so that if I look at my teeth from the side, mouth closed, the chewing surfaces of the two last upper molars can be seen, as they are now facing my inner cheeks and are no longer completely horizontal or facing down. I hope you can understand from this description. I wear braces on both bottom and lower arches and I am 43. I’ve read that past 18, crossbites are not easy to correct. I’ll call my orthodontist about this issue and I stopped wearing the elastics until I’ve spoken with her, but was curious about your opinion on that. Will my molars stay permanently in that position now? I would not think so as such positioning would not constitute a correct or ideal occlusion. Will I have to wear elastics in the opposite direction to “redress” the molars so that the chewing surface faces down again? I’ve been wearing my braces without any other problem for 6 months now. I have been given a treatment time of 20 months. I also have a protuding canine on the upper left which has moved back into its correct position almost perfectly. I really like my orthodontist and am confident she will address the issue when asked, but as I said, would like to hear your opinion. Thank you so much for this invaluable service you provide. Hi, In your situation the crossbite elastics have tipped the crown of the molars. Your orthodontist can use root torque to upright the molars. I believe you are at an intermediate step and your orthodontist will address the molar relationships. At my most recent appointment they scheduled me for two upcoming ones. One for impressions, and another one following. I’ve had my braces for almost 2 years now. Does this mean I should be getting them off soon? Hi. It’s possible. They may take impressions to make your hawley retainers and place them at when they remove your braces at the following appointment. Hi, I am currently under the orthodontists for my jaw surgery that will be getting done later on in life. I have been told I need braces and have not yet been giving them but have been given an appointment on the 29th, I’m guessing this is for impressions of my mouth as I haven’t had them done before. I was wondering once they have taken the impression can they give me an appointment on that day for another day to come back and get the braces? Or do they have to wait for a bit to check the impression out? Thank you! Hi, Most patients schedule their next appointment at the end of their appointment. The orthodontist can look at your models at any time and doesn’t require a lot of time. I have been wearing my removable retainer for my upper teeth for longer than my orthodontist said (12 months). How should I dispose of my retainer if I decide that I have no need/ do not want to carry on using it. Hi, You can just throw the retainer away in the normal garbage. No special disposal required. I’d advise that you wear your retainer into your 20s. Small growth of the face can allow teeth to shift if you are not wearing retainers. Hello Dr. Thompson. I got my braces off about a month and a half ago (Jan. 25) and I need to have my wisdom teeth removed. The problem is that I’m scheduled to have my wisdom teeth removed at about late April. I worry that I won’t be able to wear my retainer due to pain, so I’ll have to go a few solid days without wearing a retainer. But if I wait until my teeth are more solid, then the wisdom teeth will ruin my straight teeth. What should I do? Thanks. Hi, I would have my 3rd molars removed after I have worn the retainers for a least six months full time. Then you will have a less chance of teeth moving when you are unable to wear them post surgery. Hi, Not sure. Braces will move your teeth even during irregular/sporadic visits. Hi I am a 21yr old male and my Ive had a root canal on teeth 8 & 9. Ive had temporary fillings and will soon be getting crowns. Ive recently moved and my new dentist actually suggested i consider invisalign before my crowns due to my canine 27 being slightly in line with my upper teeth, though it barely touches my upper teeth only when im biting down real hard. The rest of my teeth are nicely aligned. He said that teeth 8&9 might be damaged as my teeth grow outwards with age. Would you say invisalign is necessary to protect my top two front teeth? And if i dont get invisalign before my crowns, will it be too late to get it after? Hi, If the teeth need to be moved so that the crowns can be a proper shaped, then have Invisalign before the crowns are placed. If that is not the case, I’d suggest Invisalign after the crowns are placed so that you can get a good proper occlusion with the new crowns as well as all the other teeth. I took out my elastic ligatures to wash them because they were discolouring. I held them under hot running water for probably about ten seconds all up. I am a bit worried now that because they are rubber/plastic, the chemicals might be leaking when have them in my mouth. Is this a legitimate concern? Hi. No, all products used in the mouth are approved by the FDA and do not leak any chemicals. You should not be concerned about your elastics. How old can you get braces? When do you need braces? How do you know if you ned braces? Hi. Patients of all ages can have braces used to correct a malocclusion. Braces are used to correct a malocclusion. Consulting with an orthodontist is the best way to determine if orthodontic treatment (braces) are needed. Hi, Wear your retainers as instructed….. 24/7. If you do not, you have a high chance of relapse which your orthodontist may say you need braces again. Do as your orthodontist instructs. All your peers knows what a retainer is. They will not be upset that you have to take your retainers out during lunch. I had my upper wisdom teeth removed about 4 months ago and trying to get braces. Would my teeth still be pushed back alright? I heard that it’s best to start braces as soon as you get teeth extracted but would it still work well in my case? thank you! Hi, The extraction sites will heal nicely and when you get your braces started, the teeth will retract just as well. The length of time starting braces after extractions are not important. Hi I recently went to the orthodontist and I have been making progress but stupid me I chewed gum and he had to take out 3 of the 4 metal things on my molars i think there called brackets in my mouth. I won’t have another appointment till next month how much time will they add on for this thank you. Hi, Probably a couple of months. Hi. I suggest you see your orthodontist to have your retainers adjusted. Hi. Ankylosis occurs when the periodontal ligament breaks down and a piece of bone or cementum bridges the periodontal ligament gap from bone to root. The ankylosed tooth will stop erupting. Almost always, the ankylosed tooth is extracted and treatment proceeds successfully. We do not know why ankylosis occurs. Hi I got my braces today and only top teeth it hurts and I have got a poking wire i have put wax on it so what shall i do now? Hi, If you cannot become comfortable in a couple of days, call your orthodontist and see if they can fix the poking wire. 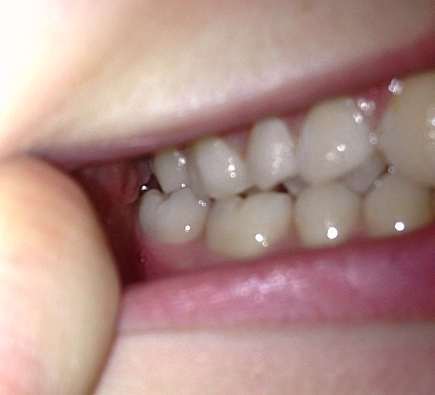 hi im 13 and my bottem teeth are perfectly stright but my front teeth has a overbite how long do i need braces and do i only need top braces is that a thing???? Hi, Overbites take time to correct, more than a year. Braces would be needed on upper and lower teeth. I have this permanent retainer behind my lower front teeth and sometimes it feels like it moves, is it just my teeth adjusting more to it or is it becoming loose? And are they actually permanent? Hi. Lower fixed retainers will come loose and need repaired from time to time. They are not permanent. See your orthodontist soon for an evaluation. Hi. It depends on how far the cuspid has moved and why it has moved. Treatment may consist of a hawley retainer with a fingerspring, interproximal reduction (IPR), braces or Invisalign. So I have a twin block and I’ve worn it for over a year and a half but a few months ago I took them off and I haven’t put them back in my mouth since. My mouth doesn’t look too bad and my over bite is pretty much gone but because I haven’t worn them I’m slightly worried about what my orthodontist will say/do! Also, would it be dangerous to put my braces back in? Will my mouth have altered at all? I know I should have been wearing them but I just hated them so much so at around new year when I took them out I just didn’t see why I needed to put them back in. Hi. Since it has been a while since you wore your twin block, you may want to consult your orthodontist to see if the twin blocks are needed and evaluate the fit. I have braces and my dentist put a power cord in my teeth, but a couple days after the bottom of my gum started hurting and there is a white spot there. Is that my tooth? Hi, Elastic power chain is used to slide your teeth along the wire to create space. After the space was created, your unerupted tooth may have enough room to erupt. That is probably what you are seeing. I’m sort of guessing since I visually don’t know what the white spot looks like. I just had my braces on and i’ve been reading your advice. First of all I would like to thank you for you time and effort. My Dr. mentioned that I will need fillings in the back of my teeth and said that I might need a few days off work. Is this normal? I just wanted to ask if it will hurt and bother me for a long period of time and how bad will the pain be. Hi, Usually when a tooth is restored (filled), it is numbed and the patient has no pain. After the filling, a patient usually can go back to work normally. I have gotten retainers within the last few weeks and noticed my two front upper teeth have been pushed up into my gums I am not happy with it because I can really tell. Can you please tell me why my retainers have done so? And can it be fixed? Hi, If you are using a clear plastic retainer (essix), they sometimes will not prevent teeth from relapsing by moving gingival. You need to show your orthodontist what is happening. They may need to reshape the central incisors to relieve pressure which is moving your teeth upward. My orthodontist placed a 0.16niti wire in an 0.18 slot and gave me power chain from molar to molar to close my diastema. I just have 2 months time. Will this treatment plan cause any harmful side effects? Hi, None that I can think of. Usually, to close a diastema between upper central incisors, the power chain is placed from incisor to incisor. Hello my dentist has asked me to wear orthodontic bands but I need to know what the positioning will do.? And I cannot post a picture here to explain. Kindly advise ?? Hi. Usually elastic rubber bands are used to reduce an excessive overjet. Hi how are you? I’m a first semester college student I’m studying Dental Hygiene but I’m wanting to become an orthodontist am I on the right track towards my goal ? Hi. Yes, the courses for dental hygiene would help with applying to dental school. I’d advise that you contact the dental school that you plan to attend and get their brochure. It will outline what college courses are required to apply to the dental school. After you receive your dental degree, you can then apply to a post-graduate orthodontic program. Hi. Power chains are used to close spaces. Wires can be segmented and not attached to all the teeth. Now I’m using my elastics as directed, but I also use Class I elastics (from my canines to the upper molars) because I thought that it would maybe fix everything quicker? She didn’t talk about Class I elastics at all, but I thought that maybe I should try it so that everything get’s fixed faster. Should I stop using Class I elastics or not? And also are there any other ways to fix my overbite faster? My teeth are aligned, the problem is the overbite, and I want my braces removed before the end of august ? Hi, I would not wear Class I elastics. I’d only wear the elastics as your orthodontist has instructed you. When getting rid of an overjet, retraction of the anterior teeth, if needed, usually requires posterior anchorage so the extra elastics may move posterior teeth forward (mesial) causing it harder to correct your overjet. Severe overbites take time a lot of time due to the fact that we extrude posterior teeth and intrude anterior teeth. There are no ways to make the teeth move faster. Hi, a fixed twin block is attached to the teeth with cement that is approved by the FDA for use in a patient’s mouth. When the twin block is removed, your dentist will remove it in such a way to not remove any teeth. The cement and acrylic will not hurt the enamel. Hi! what foods to avoid with braces? can you chew sugarless gum? About 7 years ago I stopped using my top retainer after invisible aligner treatment on my upper and lower teeth. My upper and lower teeth have since began to crowd and I need orthodontic treatment again. I am considering another round of invisible aligners from an online provider. I have two problems. The first is that I have a permanent aligner that is boned to the back of my front lower teeth that has to be removed to take impressions. I am weary of having the retainer removed in the advent that my second problem makes me a bad candidate for the aligners: I have a slight cross-bite where one corner of tooth #7 is behind tooth #27. Your advice on how to proceed is greatly appreciated. Hi, I’d have the lower fixed retainer removed and your teeth scanned for Invisalign. If your orthodontist thinks your lower teeth will shift too much by the time your aligners come in, they can hold your teeth in place with an essix retainer. Invisalign can get rid of your cross-bite. Hello! I have been wearing class II elastics to correct my midline, but I’m questioning the placement of the elastics. My midline is more toward the right side of my mouth. I am wearing one elastic from the upper right canine to the bottom right molar. How will this placement correct my upper midline? I would think it would pull my midline to the right even more. The Class II elastic you have described can correct your midline. Your orthodontist may use an anterior diagonal elastic which would be placed from lower left cuspid to upper right cuspid. Talk to your orthodontist about the midline at your next appointment. They may change or add elastics. Hello, I have an issue. I have had braces for four years. I recently got a thick wire placed on the top (not the thickest, but close), and now my bite isn’t the same. I had a crossbite which was corrected, but now, my top and bottom teeth in the front are grinding together and not ideally aligned. What should I do? I wore heavy elastics, triangle on both sides and from the front canines to my very back brackets. Both sides. You need to discuss with your orthodontist what you are experiencing and how your occlusion needs changed. Your orthodontist will use bends in the wire and elastics to correct the occlusion just as they already have done. My eight-year-old granddaughter had an expander and a guard to keep her from sucking her thumb installed three days ago. She has almost completely shut down eating and barely talks. I know it takes some time to get used to but I think the thumbsucking guard is what really preventing her from eating or talking. Your thoughts? The thumb crib should be smooth and have no sharp edges. Run your finger along the metal and see if it is rough. If it is, see the orthodontist to have it adjusted. It should not keep her from eating and it will take awhile to get use to. It will effect speech but she will get past that in a couple of days. She may just be upset that it was placed. I’ve had braces on for 1 yr 5 months and I’ve had a transpalatal nance the entire time and today it broke while I was eating. The metal band that goes around the back tooth has come loose on the left side so it’s making the nance move position (slightly) and it’s making the band on the other tooth slide a little lower down even though it isn’t loose. I can’t go to the orthodontics tomorrow as it’s shut Sundays so earliest time I can go is Monday, but I’m worried about it getting worse before then. While it cause a big problem if I wait until Monday? No, a broken nance arch will not cause a problem. Just see your orthodontist for a repair. 1) Her lower retainer seems a little high…in other words, I can see a small amount of clear plastic at the top of her lower teeth. Is this normal, or should we request a new retainer that fits perfectly like her top retainer? 2) I have read that using 2 essex retainers keeps the teeth from not settling and can cause an open bite. Would a hawley retainer be better suited for either the top or bottom instead of 2 essex retainers? I’d say if you see space between the retainer and the top of the teeth, it is distorted and a new one needs to be made. An open bite can occur with an essex retainer if the patient is young and growing and the retainer is short and doesn’t extend over the most posterior molars. Most patients do not develop an open bite. HELP! APPOINTMENT TOMORROW!!!! My ten year old son completed treatment with braces on upper teeth and a palate spacer about four months ago. About three weeks ago he lost his hard plastic/wire retainer. I made an appointment with a new Orthodontist to have a new one made, (I will not return to the previous Orthodontist due to ethical differences). After searching and searching today, I found his original temporary Invisalign “retainer” and then his hard plastic/wire one….. Questions: Will either of the retainers help fix any movement that took place over the past 3 weeks? Which one? And do I still need to have a new one made with a new mold? Could the palate have regressed, causing the retainers not to fit at all? he says they fit, But I’m not sure. What should I do???? I’d try to use the clear retainer first. If it doesn’t fit, then a new retainer can be made. My new fixed permanent retainer is rather annoying. The glue on the left side holding the retainer in place does not feel completely smooth. The glue for the right side feels great. The glue on the left feels rough but not as bad as sand paper. I do not want the glue to feel like this for the rest of my life. Is there anything my orthodontist can do to fix it ??? And has this happened to any of your patients before??? Your orthodontist can either add adhesive, replace or smooth the adhesive on the left side to make it comfortable. Make an appointment for an adjustment. I always ask my patients if the adhesive feels smooth. What exactly does the orthodontist do to smooth the adhesive. What tools do they use?? What does the process involve? And how long does this process take. The orthodontist can use a small green stone with a slow speed handpiece, or a high speed handpiece with a 12 fluted carbide finishing bur to smooth the adhesive. Or they can add adhesive like they did when they placed the wire. It takes an appointment of about 30 minutes to repair or replace the wire. Hi, I got these retainers a few days ago and I’m 13. They fix my jaw in a position so that my teeth are aligned but this really does not look right for my face shape. Will this be permanent at the end of treatment? I haven’t had my braces yet, these are just to prepare my teeth. The place where the appliances are positioning your lower jaw will make the lower jaw grow to that position. Talk to your orthodontist about what you don’t like about the position and your perception of what you like and don’t like. A lower lingual space maintainer and an upper Nance arch are used to hold space for the permanent teeth. As the permanent teeth erupt, your orthodontist will be able to tell you if braces will be needed. I have started wearing my retainers 3 days back. Whenever I drink water they pop out. Is it normal? Also I am not able to speak properly at all even after practicing. How long will it take to speak properly? It’s not normal for your retainer to pop out. Go see your orthodontist for an adjustment. It normally takes a patient about 2 weeks to start speaking clearly with a retainer worn full time. I have a mini implant screw that I forgot to take out its been in my mouth for 6 years ??? What should I do ? Go back to the person that placed it and have it removed or see an oral surgeon. I understand that the process is not over and that my teeth are still moving, however I’m quite concerned as at the moment my top set of teeth seemed to have moved upwards if that makes sense? When I’m talking, it looks as if I have no upper teeth! I’m hoping they’ll move back down at some point? Hi. Explain to your orthodontist that you can’t see the edges of your incisors when you speak. They may want to place bends in the wire to extrude the incisors so they can be seen more during speech. Is is possible for the top fixed retainer to snap in half. Have you had any patients where this has happened to them?? If so what did they do to make it snap? Hi, I do not like to use upper fixed retainers because they tend to break. The wire usually breaks due to occlusal forces from the lower incisors hitting the wire over and over again. My son just turned 13 and still has his baby left upper 2nd molar (tooth J). It is the only baby tooth that he has left. He has braces for 13-14 months now and his teeth are straightened, but he has overbite and got rubber bands placed on today. Our orthodontist insists on pulling the remaining baby tooth and ideally attaching chain to the permanent tooth to speed up the orthodontic treatment. It would require oral surgery. He did X-rays today that showed the permanent tooth is in about same position as it was a year ago and aligned well right above the baby tooth which is rock solid at this time. He pretty much gave me 2 options: 1) to extract the baby tooth and wait for permanent tooth to erupt–if it does not erupt within a few months, than having it pulled out with the chain; 2) to extract the baby tooth and attach the chain to the permanent tooth that is still deep within the bone. Our orthodontist told me that waiting for a few months for the baby tooth to naturally fall out and the permanent tooth to grow would be “unfair” to him as he wants the treatment to be completed as predicted within about 21 months. We payed up front for the entire treatment. It sounds pretty painful. Is it really necessary or should we be changing orthodontists? Hi, if the 2nd premolar (#4) has completely erupted on your son’s right side and the radiograph of #13 shows tooth #13 on the left side in the same position, I would suggest being aggressive and have the surgery performed. The eruption of #13 could be impeded by a cyst or odontoma, which sometimes can not be seen by a radiograph and is removed by the surgery. Also, the permanent premolar could be ankylosed or the primary second molar (#J) is ankylosed. Tooth #13 may not ever erupt even if you wait. If it’s contralateral premolar is in, then #13 should be in as well. If #13 is ankylosed, it will not erupt even with protraction with the chain and it will need to be extracted. I hope that helps. I am in eighth grade and interested in becoming an orthodontist. I was wondering what college you got your undergraduate at and I am also still confused on what you studied when you got your undergraduate. This website is awesome by the way. Hi, I went to Marshall University located in Huntington, WV. It is best to be a chemistry or biology major. Read this article. It will give you more information. Hello! I’m 17 and I got my braces about 6 months ago. I have an overjet of about 1 cm and I’m congenitally missing a lower incisor on the right side (from your perspective). My alignment is complete and my dentist is fitting a Forsus appliance to fix the overjet. He says he’s moving my lower jaw forward in order to decrease the overjet. I highly doubt it because my upper jaw is protruding and not my lower jaw. Shouldn’t he be moving my upper jaw inwards? I do have misaligned second molars in my upper jaw. On the left side in my upper jaw, there’s a lot more space than on the right side. I can send you the X-rays as well. Would you like to help me with my doubt? It would be so kind. Hi, the majority of the time, an orthodontist diagnoses the patient with a deficient growth of the lower jaw when there is an excessive overjet. Your orthodontist has taken a radiograph of the side of your face and has measured the relationships of the upper and lower jaw along with proportions of your face. This is called a cephalometric analysis. Part of your excessive overjet is due to you having a congenitally missing lower incisor. Part of it may also be due to a deficient length of the mandible which a FORSUS appliance will help correct. Discuss with your orthodontist at your next visit your concerns. Thanks for your help! I asked him about this. He said the Forsus appliance would work to pull the upper jaw in and the lower jaw outwards. Also, he’s been saying that since I’m 17, the Forsus appliance might not work as expected. Is that true? It is possible to get some benefits from a Forsus appliance at your age. How do you know if your bite is corrected? And can your overbite/overjet get corrected faster if you double up? There are certain criteria that an orthodontist looks for in determining if your occlusion is correct. We are wanting to correct a malocclusion to a Class I occlusion. That is the goal. As far as elastics, sometimes wearing more than one elastic can help. Discuss this with your orthodontist before making a change. Missing upper right cuspid canine. Okay so I’ve been missing this tooth since 6th grade and now I’m in 10th grade. I hate laughing because there’s no tooth! What are some options? The space is small and it seems like I can’t fit another tooth or implant (whatever it’s called). Hi, They will probably recommend orthodontic treatment to open the cuspid space so a pontic (ie. a false tooth) can be placed. Long term, an implant or a bridge can be used as a more permanent option. I am a man in my mid seventies. I know that at my age it’s common to suffer with receding gums but I do have one molar that has almost fully exposed the root. In the space between the root prongs the cavity gets filled with items of food and I clean it out with a toothpick, as well as soft brushing and mouthwash. However, no matter what I eat, the debris I remove from the cavity between the roots is always pure white and looks like a thick cream! I was wondering if this wasn’t in fact food debris but a solution the tooth was producing itself for defence, and I wasn’t doing myself any favours by removing it. I suppose it would be impossible to have the cavity filled in any way, so extraction is probably the inevitable solution. The white stuff you are removing from the molar’s furcation is either food or plaque. It is not a defensive measure of the tooth. Molars where the gum tissue has receded to expose the furcation cannot be restored with filling materials. They can only be cleaned. Please continue removing the debris daily as you have been. Hello. I have had braces for about a month now and had a bite plate put in two days ago which I am to have on at all times. I have a very bad lisp. My job requires me to talk a lot for I work customer service and it’s really hard for others to understand me. I’m also in a speech class. I am to give speeches to the class 2-3 times a week and I’m worried my lisp will affect me both at work and in class. I am to have the bite plate for 9 months. Will my lisp go away soon?? Hi, It doesn’t take long to get rid of the lisp with full time wear. Less than a week. I am currently half way done with a biology major at BYU-Idaho. I am seeking tips for dental school application. In addition, I was curious as to whether or not you were paid during your 2-3 year orthodontic residency? Also, is it easier to get into an office working with other doctors /working for another doctor or making your own business? What are the benefits of working for someone else? I appreciate your time, thanks! Hi, there are no stipends available for an orthodontic residency that I know of. My wife worked and I did lab work for a local orthodontist for some income during residency. As far as employment by another orthodontist, you have to beware of restrictions placed on you to break away and start your own practice in the same area. Covenants not to compete can restrict you by mileage and duration, like 150 miles and 5 years. After graduation you can connect with a placement agency like Benston – Copple & Associates. The best option for me was to take over an existing practice and hit the ground running. I just started using the box elastic for my braces. Which goes for my top teeth to bottom. During lunch I was trying to take the one elastic off and I managed to get the top off but not the bottom. I cannot get it off because my nails are literally irritating my gums making them bleed. My teeth are hurting and probably going to move. And my orthodontist is closed for 3 days. Hi, I suggest you take scissors or fingernail clippers to cut the elastic and then pull it out. I recently got my braces off and received a top retainer. It had cracked but my orthodontist said it should be okay. Now however it’s creating a gap in my teeth. But I tried not wearing it for two days and I can feel them shifting. What do I do? You need to see your orthodontist to show them the space that is starting to form. Try to wear your cracked retainer full time. I’d suggest you ask for a new retainer if the space will not close. Hello, There is no permanent damage. The pain will be only temporary and you should be able to get your braces off soon. I had my premolars removed, and the gap keeps coming back more aggressively on one side than the other, even after going through braces twice. The first time I was never given retainers so the gap came back. The second time, the gap never really closed at all. My orthodontist ended up being pretty shady and kept adding on expenses and time to my treatment, even though it wasn’t supposed to take more than 12-18 months. We were at the year mark and he added another 15 months, which would extend my loan. It was a messy situation. What options do I have? I really don’t want to get braces again, as both of my experiences have been sour. My smile is uneven as my gap on one side is larger than the other. Help! Hello, I would contact a new orthodontist who would do your treatment for a flat fee regardless of how long it takes. Most orthodontists quote a flat fee for treatment. If the treatment takes longer than the estimate time, there are no extra fees added. That way you know exactly how much treatment will cost, the orthodontist wants to finish your treatment on time and there is no uneasiness with the orthodontist if treatment takes longer. my daughter wears braces and the orthodontist says her front two teeth are narrow as her bottom two teeth are wider and he wants to slim them..how? and is he going ruin her teeth by removing enamel? Hello, Interproximal reduction (IPR) is very common in orthodontic treatment. There is a lot of enamel that can be removed without damaging the tooth. Certain teeth need IPR because they are not shaped properly. Hi, Call your orthodontist and see if they want to repair them before your next visit. hi ive worn my retainer every night for about two years and i havent had it out for more than 12 hours since ive been able to keep it out for 12. just recently in the past month is has consistantly gotten tighter and tighter and does not touch the roof of my mouth anymore (its a normal retainer with a wire on the front), is this due to the fact that i tried to get calcium off of it? and is this and indication that my retainer doesnt fit anymore?? Hi. I’d say you have grown and your retainer doesn’t fit well. I’d see if your orthodontist would make you a new retainer. I got my braces off two days ago. I’ve recently discovered a white spot on my tooth that is below the surrounding enamel creating a sunken area. What has caused this to happen? Is this white sunken area permanent? And Is there any solutions to fix it? Hi, it sounds like the sunken white spot is the beginnings of a cavity. See your family dentist for a possible composite filling. I started a cheek sucking habit for about a year, as well as used a drugstore nightguard for a few weeks, and by the end of all this was left with an anterior open bite. I would like to know if these factors had caused an open bite by either teeth movement or by altered jaw development. I had began menstruating 3 years before all of this happened, if that helps answer. Could an orthodontist or oral surgeon confirm whether or not jaw development had been altered from the cheek sucking/nightguard and caused the open bite? Or confirm if it had been caused by only the teeth moving? Hi, In my opinion, intermittent forces from cheek sucking habit cannot create an anterior open bite. Chances are you were genetically predisposed to develop an anterior open bite. Consult with an orthodontic specialist for advice on how the open bite can be corrected. So I am having 4 pre-molars extracted and my braces are currently “segmented.” The pre-molars have no bracket, etc. and the only teeth with wire+bracket are the teeth in between the pre-molars. The other teeth have brackets but are not attacked to any wire. After I have my pre-molars removed, I will still have about a month until my next appointment. I am just curious, in between the time my teeth are removed and my ortho appointment, will the teeth attached to the wire move any…at all? I am excited to see the changes that will occur once those teeth have been extracted. Hi, Yes your teeth will move. Even the teeth not attached to the wire will move since you have had 4 premolars extracted. hello i was wondering how much did all 10 -11 years of school cost and is it easy to get hired or is it better to start your own business. Hello, When I went to dental school, in state tuition was inexpensive. The debt a dental student could incur would be in the 6 figures at the end of the orthodontic graduate program. After graduation it is easy to start working. Some orthodontists like to work in a group, some do not. Hello I’ve just got my braces off and I smashed my 2 front teeth. It bled a little and I feel as though the gap is now big! Please help what can I do?! Hi, Go see your orthodontist or family dentist for an evaluation. Hi, When ugly my braces put on my lower row of teeth i relised that one of the brackets was tilted really bad and was on the very side of my tooth but i dint really think i was gonna be a problem. However that tooth now has turned completly sideways and back words so my once straight tooth is now really crocked and sticks out in my mouth it Also really hurts and Does not look right but my ortho doesnt really care she just said that at least my other teeth are okay !? It just annoys me that before i got braces they were straight and now their not i dont know What to do becasue the more i get them tightend the more crocked that tooth be comes any advice?? Hi, Ask your orthodontist at every appointment about the concerns you have. They should be able to address them. I just got my braces taken off and I have permanent retainers on the top and the bottom teeth, but my bottom teeth are contacting the big pieces of glue they put on the top and my back molars don’t touch because of this, I feel like I’m going to break the retainer and my teeth are going to shift weird. Hi, You may want to talk to your orthodontist about the premature contacts you are experiencing from the upper fixed retainer. If there is not enough clearance, the upper fixed retainer may come loose. They may suggest another retentive method. Recently i just got a MARA put into my mouth to help with moving my jaw forwrd because I have an overbite and I also have braces. The usual things have happened like, a little bit of pain and it’s a bit hard to eat but i have noticed that i also have a lisp. I was just wondering if that would go away? It’s quite annoying and especially since I sing, it’s really hard to say words. I actually haven’t even got the whole appliance fully in yet, I still need to get the little bits that will be used to slide my jaw forward when I bite down, so will the lisp just get worse? Hi, You will get use to it and your lisp will go away. hi, i recently just got a minor surgery for having an impacted canine and they put a gold chain in my mouth attached to the tooth and tied it to the front basically. the part that was tied to my front teeth came undone somehow and when i woke up the chain is just hanging, what should i do? will i need to redo any surgery? Hi, Nothing needs to be done. Just call and tell your orthodontist that it is loose. No extra surgery will be needed. They will just activate the chain by attaching it to the wire. Hi, I’ve had my braces on for 3 months now and my two front teeth no longer have a gap between them. However, I have noticed that one tooth starts higher in my gum than the other making it look like my teeth aren’t evenly sized in length at all. I was wondering will my braces fix this issue ? Hi, It is normal for the gum tissue to cover part of the enamel close to the gum tissues during treatment and in a young person. Once your braces are removed, and your jaws matures, the gum tissue will retract to the cementum enamel junction (CEJ). Both of the teeth’s clinical crowns and it’s counterpart should be the same length at that time. An orthodontist uses the occlusal surface of a tooth or the incisal edge to align the teeth, not the CEJ. Is it normal to get dental impressions and to get braces put on the same day ? Shouldn’t they look at them first to figure out where to put the braces? Hi, Usually the orthodontist does a workup and develops a treatment before braces are placed. I’ve got a question that I have heard a lot of controversy about on the internet. Is it okay for you to use whitening toothpaste or mouthwash while wearing braces? I’ve heard people taking both sides of the argument and wanted to know what you thought. Hi, I don’t think a whitening toothpaste or a mouthwash would cause any difference in the enamel exposed and enamel under the bracket. I would stay away from the OTC whitening solutions until the braces are removed. So i’ve had braces for almost 4 years, I was assigned to wear elastics 2 years ago but I never wore them as I should until last year. My orthodontist said my bite is the best it’s ever been (i had a really bad overjet) and i’m wearing my elastics hooked onto the top right hook, under the bottom left, then hooked onto the top left hook that they installed themselves. it’s supposed to pull my bite down completely but i’ve noticed that it only pulls one side down completely and the other side comes down and touches my bottom tooth.. so i looked up ways to wear elastics and i seen that with class 3 elastics, it pulls your bottom teeth behind your front teeth when they are too close which in the video it looks exactly like my teeth.. so i was wondering since i have an appointment in june would it be bad to try wearing class 3 elastics some nights and wear it how they told me the other nights just to see if i can spot a difference? because every time i wear it as they told me to, only one side of my bite comes down and it’s getting frustrating. i haven’t been able to talk to my orthodontist about it yet. Hi, You need to wear your elastics as instructed and not change how you are wearing them. I say this because your orthodontist wants you to wear them for a specific reason. Once one goal is accomplished another goal can be addressed. Hello, My top canine tooth isn’t touching my bottom wire when I close my jaw and I’m using bands but they aren’t working, is there another way to put my bands so there isn’t a gap between my top teeth and side bottom canine? Hi, Interarch elastics are used to close a bite. That would be elastics that go from upper teeth to lower teeth. You need to tell your orthodontist that you think your elastics are not making a difference. They will probably change the length, strength, length of time worn or how they are placed. My son is 6years old . He had a round face but as he is growing up his face shape is getting longer . What kind of treatment should I consider for this? Kindly suggest . Hi, There is no suggested treatment for changing the lengthening of the face. This is considered normal. Your son’s genetic code will express itself in the growth that he is going to go through. If the jaws are not growing normally or you think he needs a consultation, you can obtain a consult at this age from an orthodontist. I began orthodontic treatment with all four impacted wisdom teeth. I have crowding in the front of my bottom jaw and an over-jet/overbite on the top with no crowding. Before I started treatment, my ortho told me that extractions weren’t necessary but he wasn’t positive. Half-way through treatment (1 year later) he told me that I had to have all four wisdom teeth extracted plus all four secondary pre-molars and that it would set my treatment time back. I was originally scheduled to have them on for 2.5 years before extractions and now I am looking at approximately 3 years since my overbite got worse from my ortho trying to straighten my teeth without any room to move them. Currently, I have all eight teeth removed and now–instead of correcting the overbite and crowing–he is moving all four first pre-molars into the holes where the second pre-molars were. This seems like an unnecessary step. why can’t we just start moving everything back now that my gaps are closed and there’s ample space? Is this just to be spiteful? Hi. With the 2nd premolar space created, your orthodontist is going to unravel the crowding by retracting the 1st premolars, then the cuspids and then finally the anterior incisors. When there is crowding and extractions are needed, the space has to be closed a certain way so that we can use all the space to the patient’s benefit. I have a wired retainer (I think it’s called Hawley). I am 23 years old and have had a bad habit of not wearing my bottom retainer. I am able to put the retainer in, but it’s pretty tight. My teeth have now been going back into their place but I have noticed that the retainer is making indentations that are painful on my gums. I am really trying to avoid having braces again. What should I do? Hi, Go see your orthodontist. They need to take some of the lower retainer’s acrylic away and polish it on the lingual flanges. If you don’t get this acrylic removed, it will keep irritating your gum tissue and it will get worse. Once your retainer is adjusted, you can go back to wearing it full time for about a month then night wear. Hi, It is normal to have some speech problems after braces are placed. You will get over it quickly in about a week. I am 15 years old and I have had braces a little under a year now. At first I had an expander for a short time. Currently, I have missing lateral incisors, so my canine is moving to take their place, but my baby lateral incisors are loose, so I have to get them pulled along with my baby canines. They will then move the adult canines in the lateral incisor position. I’m wondering how long do you think it would take for the canines to come down? And if they’re are any other options for the large gap when I’m waiting. Hi, Once a small part of the cuspid breaks the gum tissue, it can be brought down quickly. There is not much that can be done with the gaps while you wait. Any false teeth (pontics) that would be used, would just be in the way of moving your teeth. Hi, I am 17 years old and set to have my first bicuspids on the top and bottom removed for braces on Friday, May 26th. I recently read that the removal of these teeth can result in TMJ or a sunken facial profile. I am now considering not going through with the procedure. Do you have any advice? Hi. Four premolars are usually removed when a patient has severe dental crowding. It is not true that you get a sunken facial profile and TMJ dysfunction from the extractions. The space can be closed carefully keeping support for the lips. The chances of TMJD is lessened by a normal occlusion. If you are concerned about the treatment plan, obtain another orthodontic consultation. Hi – I have visited 4 orthodontists with my 6yo daughter to see how they would treat her, and I”m wondering your thoughts on an issue. She has a cross-bite, crowded jaw, ankylosed 2 second molar, and a full blockage of her nasal passage from her adenoids (we just found this out from the panoramic x-ray done this week by our most recent consult. They referred us to an ENT for evaluation. She has a history of loud snoring). She has lost the two bottom central incisors, and her right lateral incisor on top (there are about 4 other teeth that are loose). Everyone proposes a RPE (3 of them a permanent one, 1 a removable one) to correct the cross-bite and create some more room, and 3/4 of those visited would wait on removing the ankylosed tooth to a later time. Our most recent consult wouldn’t put in the RPE until she has her central and lateral incisors in. I believe, and it was proposed that this could happen about February. (She turns 7 in January). However, they would put braces on her teeth in conjunction with the RPE. This was the only office to recommend braces with the RPE. The reasoning was to move the teeth to create more room for when the others come in, and perhaps to prevent tipping of the teeth during expansion. I figure that means she would have braces twice. The other docs just proposed the RPE without braces. One of the other consults wanted her 3-4 top incisors out before starting the RPE. Are there medical benefits/data to show that oing the braces with the RPE at such a young age for Phase 1 is advantageous in the long run, or could it be a “practice management” decision perhaps? Thanks for your time. Hi, I like fixed RPE treatment without using braces at the same time. I usually like to expand the upper by separating the palatal suture first and allowing the bone to heal. That takes about eight weeks after the last turn of the RPE. Then, with the new bone in place, anterior incisors can be moved with braces. Fixed RPEs creates orthopedic movement of the bone. Removable RPEs mainly tip posterior teeth only and not much of the palatal bone is expanded. Hi, I’m 21 years old female. I would like to ask regarding wearing braces. I had when through open heart surgery last year 20th June. So, is that it will be any problem if I wear braces now? Hi, You should be able to go through orthodontic treatment if your cardiologist approves. Your orthodontist needs to talk to your cardiologist about the medical protocol that you need to use while you are in orthodontic treatment. My 15 yr old son just had his braces put on. His lower front teeth have metal wired brackets and they left about 2 cm of extra wire w bracket not affixed to any teeth. They said they left it so they will have the wire to affix once the tooth is extracted yet that will be in 8 weeks. That 2 cm of dangling wire caused him to get about a nickel sized canker sore within 24 hrs. He was in a great deal of pain until they said for us to cut the excess wire. Is this normal to leave a dangle of that size and with a bracket not affixed? Hi, Usually all wires are attached to a bracket or they have a tissue sleeve covering the wire if they skip a tooth. The tissue sleeve is a rubber tube that wraps around the wire and prevents sores from developing. I’m getting my braces off on Tuesday. I’m getting a bounded retainer on the bottom but no impressions were taken for the wire. Is that normal? Should I be worry? I was reading online that impressions are usually taken before to contour the wire. Hi, Some orthodontists will bend the wire during your visit chairside and an impression is not needed. Hi. I’d talk to the current orthodontist and get a progress report. Make sure they explain what is happening and why the treatment may not be working. Try to find out what options are available for your son. If you are not satisfied, seek a second opinion. Without a physical exam and records, I can’t add much more. My son had braces for small gaps between his teeth. He wore them for one year. He stopped mid treatment. His teeth now look like an upside down U when he smiles and his front teeth were intruded as well. the orthodontist said he was going to extrude them during the second half of treatment. The orthodontist said his teeth will move back to their original position, (which is much better then how they look now) now that the braces are off. Will his teeth also move back down, and will his front teeth extrude on their own? He is 14 years old. Thanks for your help. Hi. His teeth should extrude some but it may not make it all the way for a good smile line. A good smile line is the edges of the upper incisors curved along the lower lip when smiling and talking. An upside down smile line needs corrected and hopefully you can start the second phase of treatment soon. Hi. The wire lace that is under your main wire is to hold the teeth together and prevent a space from opening up. Since it broke, you may want to call your orthodontist and see if they want to repair it. hi , i just got my braces like 3 months ago and i was wondering if wearing rubber bands right now mess up my braces even though my dentist hasn’t recommended them for me ? Hi, Do not wear elastics unless instructed to do so. Wearing elastics needs to be approved by your orthodontist. It can change your occlusion in adverse ways. Hi, I am a teenager under the age of 16, and I have an overbite and a large gap between my front teeth, I was given twin block braces to try and fix my overbite, but the bottom one was to small and uncomfortable, I had a new pair made, but my back teeth grew again, and it was really uncomfortable, so I didn’t wear them, i also have 4 back teeth removed the braces could realign my jaw, but now i am no longer allowed braces, but I would really like to have me teeth straightened, and i am wondering if there is anyway to get braces. would i have to get a new dentist? Or would i have to pay for them? Hi. You probably need to see an orthodontist and ask about privately paying for your treatment. Hello, I am 43 and just got ceramic braces two days ago. After the first night, I almost went back in to have them taken off and just live with my crooked teeth. I am not able to eat / chew on anything…just soft foods that I can swallow. Is this normal? I have a blue thing on a back tooth so that my upper teeth do not hit the bottom teeth. Also, what are your thoughts on Invisalign. The orthodontist I am going to did not recommend Invisalign to start with, but to use braces for 6 months and then possibly go to Invisalign. Other orthodontists said I could start with Invisalign. Thank you so much. Hi, It is normal for a patient to have sore teeth and go to soft foods during the beginning of treatment. It can take up to two weeks to get past the initial discomfort. After the initial month, your discomfort should be less because the periodontal ligament has widen and your teeth are slightly mobile. Invisalign is a good product and you can obtain good results with it. Hi. Call the office and see if they want to see you sooner. Hi, I just recently got my brackets on but not the wire yet. My lateral incisors are smaller than my central incisors and canine teeth. The doctor said that it is something he can not fix. But will my wires look weird because my teeth are not the same length and what can I do about them? Hi, When your braces were placed, they were placed in such a way that when the wire is straight, the edges of your teeth should be straight. The brackets are called a straight wire appliance. In the beginning the wire will not be straight and over time, your teeth will move and your smile will look better.